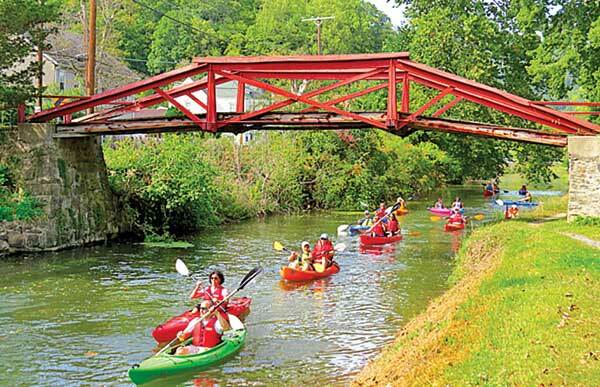 Friends of the Delaware Canal - Times Publishing Newspapers, Inc.
Its primary goals are to ensure that the Canal is fully watered and the towpath trail is usable over its entire 58.9-mile length from Easton to Bristol. The Friends embrace this mission in order to sustain a unique link to our heritage, protect beautiful and diverse natural areas, provide educational and recreational opportunities, and enable the Canal to serve as a community and economic asset. They accomplish their goals through advocacy, programs, partnerships, community volunteers and fundraising. Walks, bike hikes, kayaking trips and other activities are held throughout the year to acquaint people with the historic Canal and its opportunities. In keeping with the goal of educating people about the Canal, the Friends have restored the Locktender’s House at Lock 11 in New Hope, and it is open as a museum and visitors’ center. Members of the group are also available to visit schools and organizations to conduct programs on the Canal and canal life. Between 1831 and 1931, the Canal was used to transport coal from northeast Pennsylvania to cities, but it also hauled many other kinds of cargo. Commercial use of the Canal dwindled and in 1931, it became a Pennsylvania State Park. In 1976, the Delaware Canal was designated a National Historic Landmark. Check the “Breaking News” page at www.fodc.org to get updated information about canal conditions. The Friends are always looking for volunteers to assist with Clean-Up Day held in April of each year and other projects and activities. Contact the Friends of the Delaware Canal at 215-862-2021, by email at friends@fodc.org, or go to the FODC website, www.fodc.org, for more information.